I’d been working in the Environment Agency’s Penrith flood resilience team for just six months when Storm Desmond hit. As residents in the area well know, the storm brought more than a month's rain to parts of Cumbria (as well as Lancaster, North Yorkshire, West Yorkshire, Herefordshire and Wyre) and with it devastating floods. I’d just completed my training as an assistant flood warning duty officer so it was certainly a baptism of fire. I was part of the team providing 24/7 cover in the incident room, which was incredibly busy. We had flood support officers out in all flood affected communities throughout December. At this point, I started taking part in the Eden Recovery Group, made up of representatives from the district council, county council, local voluntary and charity organisations and members of local community groups. The group, and others like them which have been formed across flood-hit areas (including Carlisle, which I am now also part of) are focussed on helping communities get the help they need. This can range from ensuring they receive the right information on grants and funding to identifying gaps in welfare support. The groups are ongoing and still have a full turnout at each fortnightly meeting, which shows the commitment of everyone involved. They are likely to continue for months, possibly years, until we are satisfied that the recovery process is complete. Throughout January and February, I was still doing frequent flood duty shifts and trying to fit my normal day job around this. By the end of February, the weather had settled enough that the incident room could be closed for reasonable amounts of time, which has given me more time to work on flood recovery. This has included working on multi-agency community advice and support sessions and numerous other community events, such as the one pictured below which shows me giving advice to a local resident. 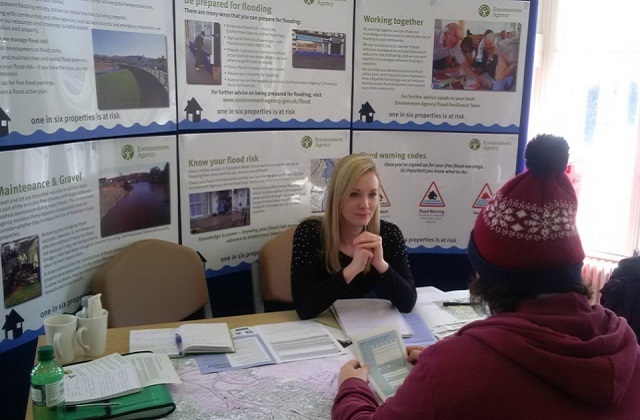 We have held flood fairs across all districts in Cumbria, designed to provide residents with advice on the property resilience measures available to them. Most of my day still consists of flood recovery work. Prior to the flooding in 2015, numerous communities had already formed their own Flood Action Groups and we are now working with many of these to strengthen their community emergency plans as well as working with new community groups which are just forming. I spend some time most weeks visiting these places, or speaking with the residents to assist with this. The relationships we build with these communities and flood action groups will continue way beyond the immediate recovery of the area. History has shown that these groups can prove invaluable. I think it’s fair to say that my workload has changed in the last 6 months, and there’s definitely more of it, but it’s an immensely rewarding job. One of my most memorable experiences was talking to a couple in Eden whose home had flooded. They’d had to move out and had lost a lot of their possessions and were obviously very upset while talking to me but were doing their best to stay strong for each other. Just before they walked away, the husband looked at his wife and said, “I knew I’d married a treasure, but this has just proven it.” That is just one of the many examples of how well people have looked after each other, and this extends not just to family or friends, but to whole communities who have truly pulled together. Find out more about how to prepare for a flood.